That which is impossible to change: The irrevocabilities of the public statements Congressman Raymond made resulted in his loss of the election. 1. Pertaining to something that is impossible to undo or to change: The President made an irrevocable statement about the economy that disturbed many people. 2. Relating to that which is unalterable and cannot be called back or be undone: No matter how Harry's fellow workers pleaded with him, his decision to quit his job was irrevocable. Something which is impossible to retract or to take back: Charles's lawyer told him that once he signed the contract to rent the apartment, it included an irrevocableness that would not allow him to change his mind and to withdraw from the agreement. Translation: "A word once spoken can never be recalled." From Horace. Another interpretation: "Think twice before you speak." Translation: "I was stupefied, and my hair stood on end, and my voice stuck to my throat." A description of the physical effects of fear, from Virgil's Aeneid; with an equivalent meaning of, "I was scared stiff." 1. Someone who arouses trouble, causes dissension, or is an agitator: The provocateurs decided to stir up trouble during the rally in order to distract the people so they would be able to steal their money and other valuables during the ruckus. 2. A person employed to associate with suspected illegal individuals or groups, and by pretending sympathy with their aims, incites them to commit incriminating acts that will make them liable for legal punishment: In the crime novel which Jane was reading, the police wanted a provocateur to incite a suspected criminal to commit a crime by selling drugs so they could arrest him. 3. 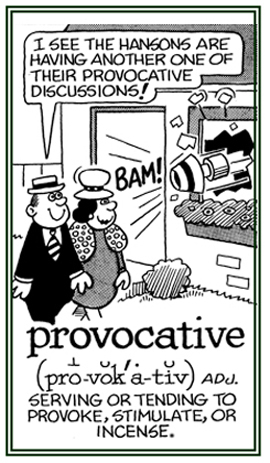 Etymology: a shortened form of agent provocateur, "a person hired to make trouble"; from French, provocateur which came from from Latin provocator, "challenger"; from provocare, "to call forth, to challenge"; from pro-, "forth" + vocare, "to call". "A U.S. provocateur's road to handcuffs"
James O'Keefe III made a national splash last year when he dressed up as a pimp and trained his secret camera on counselors with the liberal community group Acorn, eliciting advice on financing a brothel on videos that would threaten to become Acorn's undoing because they gave him and his partner, Hannah Giles, who posed as a prostitute, suggestions on how he could avoid being prosecuted by authorities. —"How a guerrilla videographer ended up in handcuffs"
International Herald Tribune; February 1, 2010; pages 1 & 8. 1. Unfriendly behavior that causes anger or resentment: Shirley's brother loses his temper at the least provocation that she has with him. 2. Something that incites or encourages someone to attack others: During recess on the school playground, George started telling lies about Jack, another student in the same classroom, and this provocation resulted in Jack using his fist against George! 3. 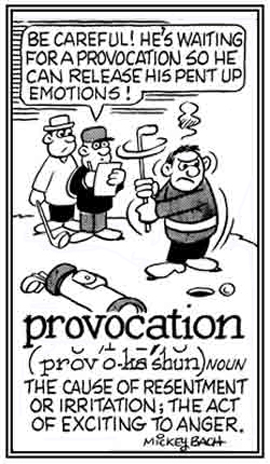 Etymology: from Old French provocation (12th century), from Latin provocationem, provocatio, "a calling forth, a challenge"; from provocatus, past particple of provocare, "to provoke"; that is, "to call forth, to challenge"; from pro-, "forth" + vocare, "to call". © ALL rights are reserved. Relating to a tendency to start a controversy: Max had a provocative discussion with his wife about where they would go on their vacation because they couldn't come to an agreement. Marvin's teacher was very disturbed by the provocative essay that he wrote for his English class. Characterizing how something is done or said in an exciting or stimulating way: Jane said provocatively to Billy: "I bet you can’t run as fast as I can!" That which tends to be suggestive or irritating: The provocativeness of some girls who were wearing very short skirts or dresses to school motivated the principal to provide some rules regarding the kind of clothing students would be permitted to wear in school. 1. To make someone or others feel angry and irritated: The noise made by Frank's friends during his birthday party late in the evening provoked his neighbors to complain about it the next day. Mary's son would not take "no" for an answer regarding his desire to go to a late movie and so he provoked her into making him stay in his room and go to bed earlier than usual. 2. Producing a response to an occasion or a cause in an emotional way: Hank's reaction to his wife's death provoked a lot of sympathy by their friends. 3. To stir someone to an emotion or a response: The newspaper article about a woman not being able to become the President of the United States provoked Mike's wife to write a letter to the publisher. 4. To bring something about intentionally by stirring up, arousing, or calling forth feelings, desires, or some responsive activity: Jerry played music in his room very loudly because he was provoked and distressed by his parents because they wouldn't allow him to stay out late with his friends. Someone who incites or stimulates a person, an animal, etc. to do some kind of activity: Holly certainly was a provoker or instigator when she incited a few of the other girls to steal small things from the department store downtown. Pertaining to how the nerves or the peace of mind are troubled because of repeated anxieties and irritations: Linda provokingly told her sister Susan that she had a much better figure than Susan and looked much better, too. 1. Something that causes a person to be angry, to be irritated, or to have a resentment: The fact that Tom deliberately threw down his cup at the dining table caused his parents to have a provokingness that made them decide to have him leave the table and go to his room without finishing his dinner. 2. An action or words which trigger positive or negative responses from someone or from a group of people: The driver drove at a very high speed, overtaking all of the cars on the freeway, and this provokingness caused angry feelings and reactions from the other drivers, who drove according to the speed limit. Showing page 4 out of 8 pages of 115 main-word entries or main-word-entry groups.